My Child is Being Bullied—What Should I Do? Recently, EP caught up with Peggy Moss, a nationally known expert on bullying and a tireless advocate for the prevention of hate violence. 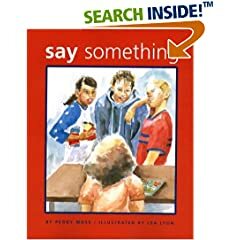 Peggy is also the author of Say Something, an award-winning children’s book that helps parents and educators start conversations with kids about actions they can take when they are being bullied, or are a witness to other kids being tormented at school. We sat down with Peggy and asked her what parents can do when they suspect their child is being bullied, and what they can do—together—to try to stop it. There’s a good chance your kid won’t walk up to you and say, “I’m getting teased and bullied at school, the kids are calling me names.” Instead, it’s going to manifest itself by your child saying, “I don’t want to go to school today.” If this seems to be happening a lot, consider the possibility that bullying might be the reason behind the sick days. Also, look for signs that kids are hurting themselves. Self-mutilation can be a sign. For boys, one classic symptom is that they are teased so much about being gay or being atypical that they’re terrified to go to the bathroom. Since there’s only one way in and one way out of a bathroom, it’s an ideal place to tease other kids. 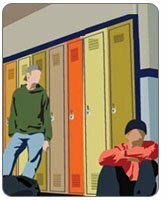 Boys who are bullied often won’t go all day, which can lead to lifelong intestinal issues. This could potentially be a sign—if your kid races home and goes to the bathroom every day after school. These are all possible signals that your child might be the target of teasing at school. Let me be clear: As a parent, teacher or health care worker, add “Bullying” to your radar when you’re trying to figure out what’s going on with a child—add the possibility that your kid is getting tormented at school. The injury is real when kids get teased—unchecked, it can be devastating. If my child comes to me and tells me he is being bullied, what is the best thing to do? As a parent, I would say let your child talk about it. Don’t say, “What did you do that made them tease you?” That’s a pit parents can fall into. Don’t make the assumption that your kid has done something to bring on the teasing. Teasing isn’t always logical, and for your kid it doesn’t matter why—it just matters that it’s happening. Listen in a non-judgmental way about your child and about the teaser. Let your kid do the talking. Don’t try to solve the problem. Ask, “What happened? How did that make you feel?” to draw your child out. And try to find out more about the kid who’s doing the teasing. Don’t say, “Oh my God, what a rotten kid,” because you’re just getting a part of the story. Your child doesn’t need you to go ballistic or take on the problem as your own. Your child needs to know that he’s being heard and that his feelings matter. Once you’ve got the whole story out, depending upon what’s happened, you can take your next step. For a parent to be explosive about the situation will cause a child to recoil. If I march to school and confront the bully on the playground, my child is not going to feel safe telling me anything about this again. I’m taking on his battle for him. So, what can I do to stop the bullying? The short answer is to let your kid come up with ideas. Ask him questions like, “What do you think you can say next time? What do you think might work?” Help your child see what the outcome might be of their words and actions; help them see that this is a problem they can solve on their own terms. For example, your kid might come up with the idea of saying to the bully, “Leave me alone, you jerk.” Instead of the parent saying, “That’s a bad idea,” respond with, “What do you think is going to happen if you do that?” Let them figure out that the bullying might escalate if they resort to name-calling. Your child might then shrug and say, “I could walk away from the bully.” You can suggest that they walk away the first time and say what they need to say the next time. We have to be honest about how hard it is to face a tormentor. It’s also important to ask your child this question: “What’s going to make you feel better about this situation?” But make sure you’re not the one coming up with the solution. It’s important that your child feels like they’re solving the problem on his or her own terms. It’s a skill you can teach them that will last a lifetime. What if my child won’t talk to me about being bullied? As long as they feel like they have a safe place to go, that is what’s important. And if you feel your kid can’t talk to you, swallow hard and say, “OK, my child is not talking to me, but they’ve got to talk.” Put someone else in that room with them that they can talk to, whether it’s an aunt or uncle, teacher, counselor, coach or family friend. Unless that conversation can start, it’s very hard to get to the heart of the problem. When should I approach my child’s teachers about it? Go in pretty early, as soon as your child starts coming home and mentioning that they are being teased. If your kid is coming home more than once a week and saying, “These kids are teasing me and I don’t like to go to the bathroom,” go in after school when all the kids are gone. Call the teacher and set up an appointment. Teachers are like everyone else, if you mention something in passing, it won’t carry as much weight. If you make an appointment, they will listen. A caution to parents: often when your kid is getting bullied, their teachers don’t know it. Kids are smart enough not to do it in front of the teacher. Bear in mind that when you go to a teacher you shouldn’t be carrying a hatchet in your back pocket. It may not be that the teacher is doing a bad job, it might mean it’s happening out of earshot. Don’t go into school assuming that you’ll be received with, “Oh yes, we’ve seen this happening.” Say things like, “My child is coming home and talking about this.” And then say, “This is how it’s impacting my child.” That’s what teachers need to know, because it may not be obvious to them. What you’re asking is for them to keep an eye out. Later, you can check in with email, and they can get back to you when you’re ready. If the bullying doesn’t stop, or it’s really bad bullying, you should go to the principal. A really great trick is to go in with a question: “I talked to Ms. Fabbiano a week ago, and my daughter is still coming home with this complaint. What should I do?” Put it into the lap of the principal and ask, “When can I expect to hear back from you about what you’ve done? What’s the next step?” Then you can tell your child that you will be getting an answer on Thursday about what steps will be taken. It’s also all right to ask educators to keep your conversations private, and then you can reassure your child about this as well. What about when it’s gone beyond verbal abuse and there is a physical threat? Once you’ve got a threat, you’ve got a crime—it’s called “Criminal Threatening.” It’s time to alert the police. You want to be in touch with the school long before you’ve got a threat of violence. When the threat of violence comes, you’re in police territory. That’s why there’s so much uproar about teasing and bullying, because once a child has been threatened with violence, it’s a really big wound. It’s hard to tell that child that they can feel safe at school ever again. Especially if the threat is anonymous. For the kid who gets an anonymous threat, going to school is terrifying minute-to-minute. There is no way a child can focus on her math test if she’s trying to figure out who wrote the note saying they were going to kill her. By the time you get to that point, you are in crisis mode. Part of it is getting a sense from teachers about what’s really going on in that school. As a parent, it’s much more complicated. If you can’t figure out who is making the threat and the police can’t figure it out, you really have to decide whether the child is safe in the school and whether you want to keep her there. The message to kids in your book Say Something is that kids have the power to stop bullying behavior at school themselves. Can you explain how this works? When we talk to kids about bullies, remind them of this truth: Bullies are cowards. Most bullies won’t tease two kids together, and almost never will they pick on three kids at once. Even in a group, bullies single out one or two kids. In terms of plain old teasing, bullies like to put other kids down, to make someone else feel lousy so they can feel powerful. Most kids who are teasing and putting down other kids are looking for approval from peers. Teach your kids that there are a lot of ways to show that you don’t approve. If someone just speaks up and says, “Whoa,” or “Ew,” or “That’s not cool,” it can be effective. If another kid can walk up and say, “Hey, come over here, you want to go play?” to the person getting picked on, that’s huge. It often will defuse the whole situation. That bully is unlikely to follow, and he has just been told in public that what he’s doing is not cool. Whether a teacher or kid breaks the assumption, now the kid getting picked on knows that not everyone agrees, and so does the bully. It doesn’t always have to take a lot of courage. Kids should know that they have the power to change their situation, especially when they work together. Peggy Moss has worked to eradicate bullying for more than a decade, first as a prosecutor with the Department of Attorney General in Maine, and later as an educator and curriculum developer with the Center for the Prevention of Hate Violence and the Cromwell Disabilities Center. Peggy has given seminars and bullying awareness workshops to healthcare providers, educators, students and parents in the United States and Canada. She is a graduate of Princeton University and the Washington College of Law at American University, where she was head of the Juvenile Justice Association. Her second book, Our Friendship Rules, co-authored with 14 year old Dee Dee Tardif, was released in May. For more information about Peggy, see www.SaySomethingNow.com. Elisabeth Wilkins is the editor of Empowering Parents and the mother of a 6 year old son. Her work has appeared in national and international publications, including Mothering, Motherhood, and The Japan Times. Elisabeth holds a Masters in Fine Arts in Creative Writing from the University of Southern Maine.